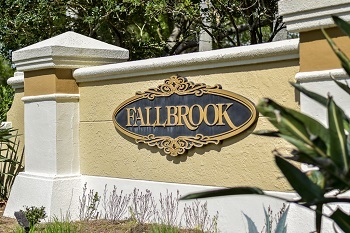 The upscale subdivision of Fallbrook in Lansbrook of Palm Harbor FL offers homes for sale in a mature tropical and lush landscaped neighborhood with water access to Lake Tarpon. Located off Lansbrook Pkwy. in the East Lake area, the gracious one and two story homes built from in the early to late 1990s are approximately 2000 to roughly 3900 sq. ft. and are moderately priced. The three, four and five bedroom homes with two and three baths, cathedral vaulted ceilings, ceiling fans, fireplaces, inside utility, volume ceilings, and large walk-in closets are spacious with flowing luxury floor plans. Imagine stepping into hardwood floored living and dining rooms with gorgeous views of a conservation area or sitting in a nook overlooking the in-ground, screen enclosed heated pool and spa. Most homes have three car garages offering lots of storage. Fallbrook community offers daily boat slips, boat ramp, tennis, ball fields, basketball, park, trails and playground access with close proximity to North Pinellas YMCA, shopping dining and recreation. This is a great community! Selling your home in Fallbrook? We are experienced real estate listing agents and have had numerous closings in Lansbrook. Having worked in the Palm Harbor area for many years, we are well informed to help you sell your home quickly and efficiently. Give us a call for a quote today or enter you information in the form below.